In the memory of his mother, Prof. Sanjay Inamdar (Founder, Flucon and Co-Founder, Bhau Institute) created a one of its kind ‘Mother-Basket Fund’. This fund has been created with a concept of providing financial assistance to needy students who are pursuing their education from any engineering institute. This help will be in the form of direct contribution in student’s educational fees or other academically expenses. Prof. Sanjay Inamdar made his own initial contribution of Rs.10L and mentioned that this is “Mother-Basket Fund” and anyone who is willing to contribute is welcome. Few eminent personalities also expressed a wish of a noble contribution in the fund. This is with a “Faith” rather than a “Loan”, that students who have benefited from this fund will put back in the fund once they start their own earnings and this way the fund will continue to grow to help more and more needy students. On 27th September, 2018 during the inauguration ceremony of 10th edition of “Ignited Innovators of India (i2i)” in the COEP College, Prof. Sanjay Inamdar presented this “Mother-Basket” to Prof. Dr. B. B Ahuja, Director, COEP, Pune. 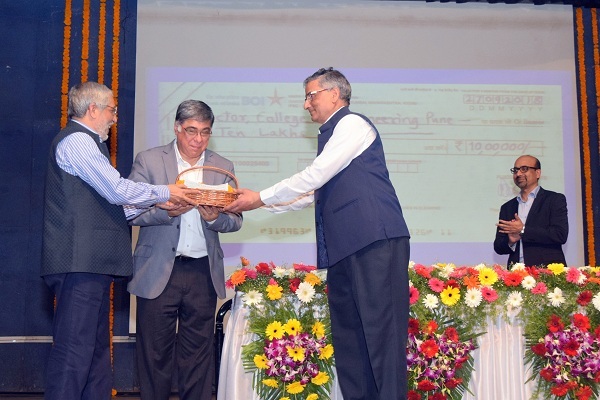 Dr. Anil Sahsrabudhe, Chairman, AICTE and Former Director of COEP and Mr. Anil Gupta, Director of Innovation, Eaton were the guest of honours with a fully packed auditorium at the function.